Well, Saints seem to have found a forward that knows where the net is, unfortunately up at the other end, they seem to have forgotten how to stop goals going in. Taking our seats before the match the conversations were all about Italian striker Manolo Gabbiadini, who had only signed for the club three days before. We had been told he wasn't match fit and had hardly played this season. What on earth was Puel up to? Well it only took Gabbiadini 12 minutes to score his first goal for Saints and prove all us fans clueless. That bit of cheer aside there was nothing else to get excited about. The atmosphere was dire, quite the worst game I have attended since the dark days of early 2009. The Saints fans were silent, except when Gabbiadini scored. Even that momentary spark was snuffed out, when Carroll scored just two minutes later. It was very noticeable that the Northam were pretty much silent and a couple of days later Matt Le Tissier had a go at the fans on social media, rightly pointing out that the players can be lifted by the supporters and now is exactly the time when they need every little bit of support. I think the thing which upset me the most was that West Ham are not even a particularly good side. Nine times out of ten Saints would/should beat them, but today it was made easy for them. The fact that Saints captain signed for West Ham on the 20th January and was appearing at the heart of their defence on the 4th February, probably also had a bearing on things. Still, once Carroll had equalised, it was all one way traffic and came as little surprise when Obiang scored from distance just before half-time. It was a hammer-blow to Saints. 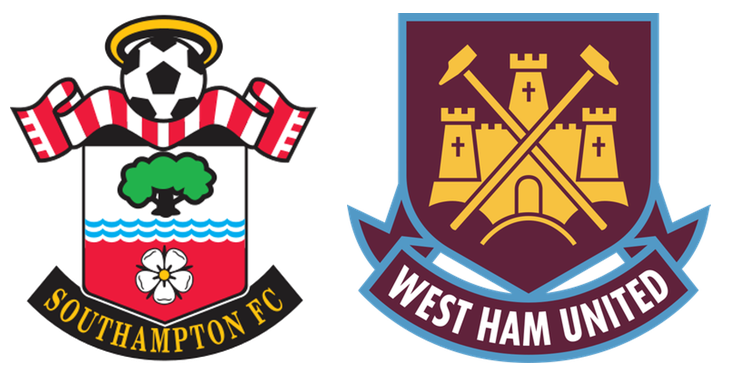 Puel decided to replace the largely ineffective Rodriguez with Redmond to start the second half, but Saints got caught within seven minutes of the restart by a Mark Noble free kick (Lord, how I hate him! ), which took a deflection off Steven Davis and wrong-footed Fraser Forster. That effectively was that and the only interest for the remainder of the match was if Saints would get caught on the break, as they pressed forward in search of a goal. The answer was 'no', but large numbers of fans decided that enough was enough, long before the final whistle. A very disappointing way to end the last home match before the EFL Cup Final, although there was the glimmer of hope that Gabbiadini, Saints new signing looked really good. There is still the ongoing CB problem. We have now lost Fonte to West Ham and van Dijk to injury (Cheers for that, Jamie Vardy), leaving Maya Yoshida, Jack Stephens and Florin Gardoş as the only recognised centre backs at the club. The thought of Yoshida picking up an injury doesn't bear thinking about, but now is the time for Les Reed and his team to get to work sifting through the available free agents. Up until this match, the Matchday Uncovered's were released on YouTube, which was easy to link to. As from the West Ham game, They seem to be only included on the southamptonfc.com website, which is not the easiest site to find anything, so from now on the most that I can offer is the direct link below . . . . This will open the Saints site in a new window. When you have finished watching, you can safely close the window to return here.